I’m never met a jar of Nutella I didn’t like. If you haven’t tried it, please do, and you’ll soon want to eat it by the spoonful. 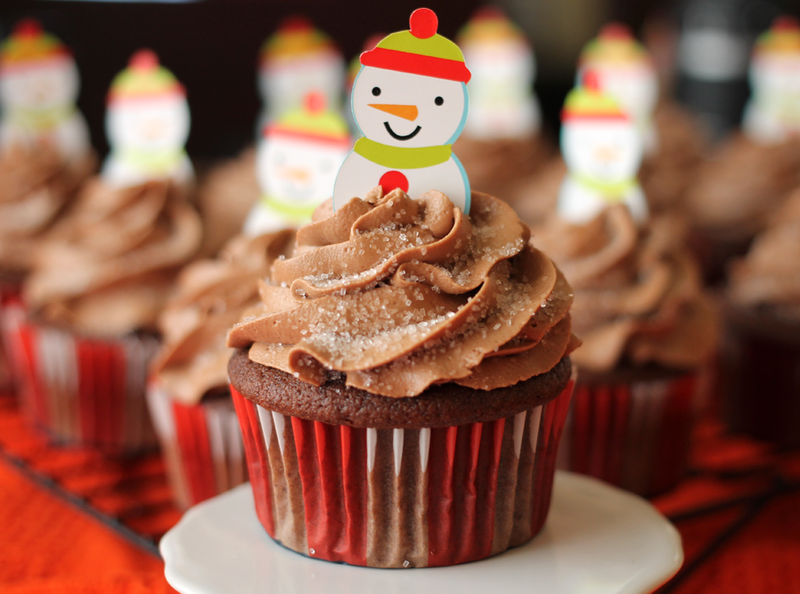 So while nothing about chocolate and Nutella screams “Christmas!” to me, I made these cupcakes for my neighbor’s holiday party. When in doubt, you can’t go wrong with chocolate. Words to live by, people. 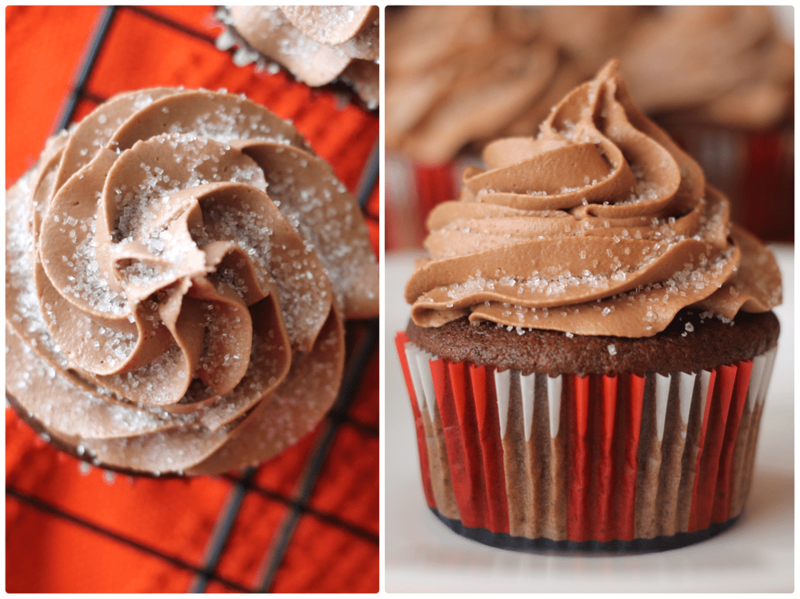 This was a new chocolate cupcake recipe I used and I couldn’t be more pleased with how they turned out. The last time I tried a new cupcake recipe it was a DISASTER. Yes, the all caps kind. 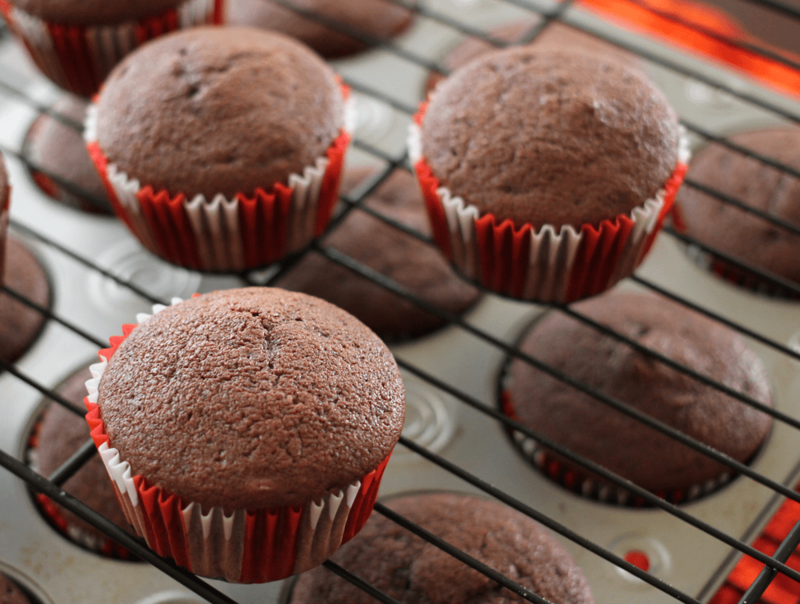 I’m talking about overflowing cupcakes, burnt edges and raw centers. It was awful. This cupcake recipe, however, was fairly simple and straightforward and there were NO overflowing cupcakes. 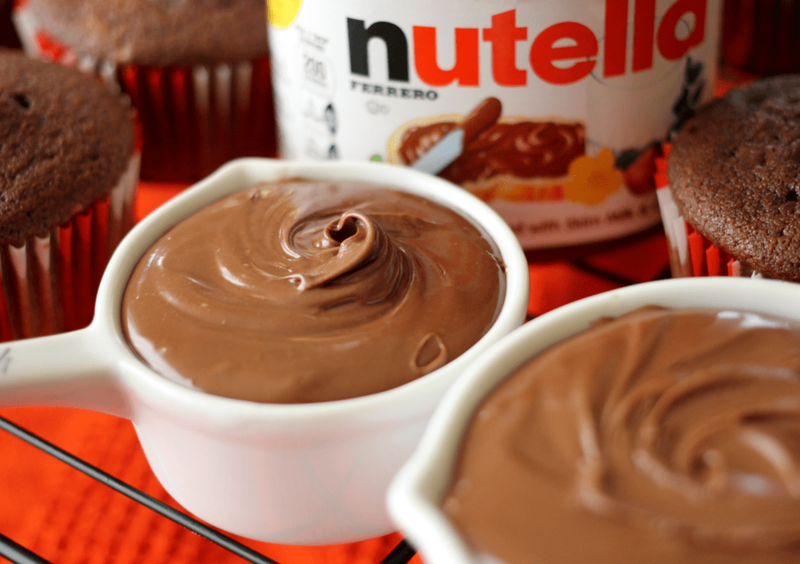 Now the crazy delicious Nutella frosting. Even the frosting is a simple recipe and that always scores huge points with me. It’s got butter, powdered sugar, Nutella, vanilla extract and heavy cream. The frosting calls for 3/4 cup of Nutella, which I did actually measure out, but then I realized that it left another 1/4 cup or so left in the jar. I guess I could have gleefully scarfed down the rest, but I added the rest to the frosting instead. There is plenty of frosting for all of the cupcakes, and then some, so I piled it high! 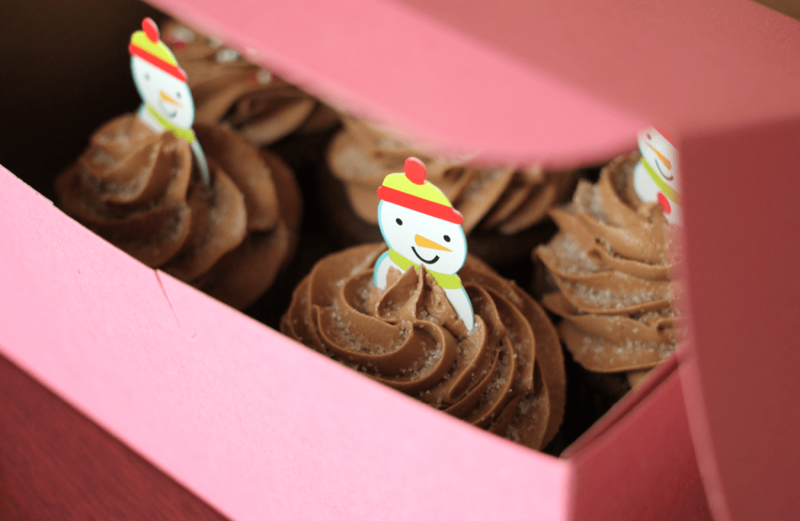 I like the look that large piping tips give cupcake frosting. It always looks so fancy and takes so little time. 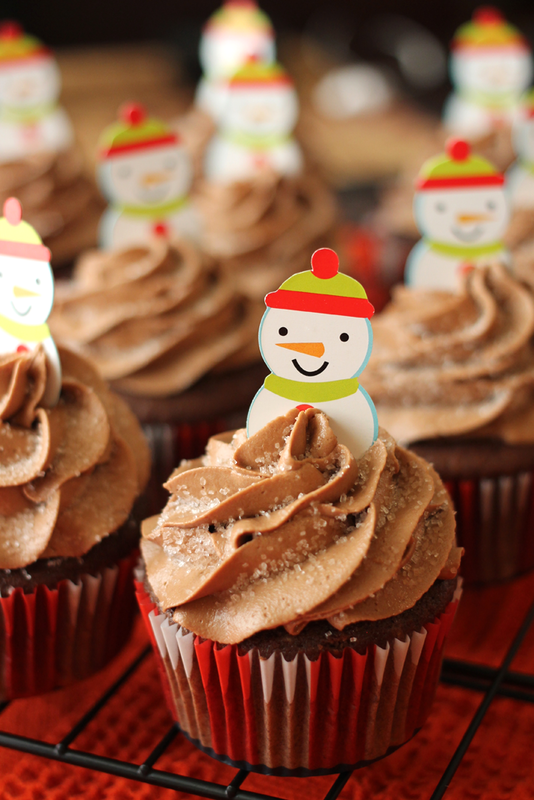 Since these were being made for a holiday party, I added a little sparkle with sanding sugar. And topped them with a snowman. Totally cute, right? Preheat the oven to 375 degrees. Line 14 muffin cupcake cups with liners. In a small saucepan, bring the 1 cup of water to a boil. Remove from the heat and whisk in the unsweetened cocoa powder. Continue whisking until smooth and then place the cocoa-water into the fridge to cool until it’s about room temp. In a medium bowl, whisk the flour, baking powder and salt together and set aside. In a large bowl, cream the butter and sugar until light and fluffy (about 3 minutes). You can use a stand mixer or electric hand mixer. Add the eggs, one at a time, beating well after each addition. Beat in the vanilla extract. Add in the flour mixture and mix until just combined. Then add in the cooled cocoa-water mixture and stir it until well blended and smooth. 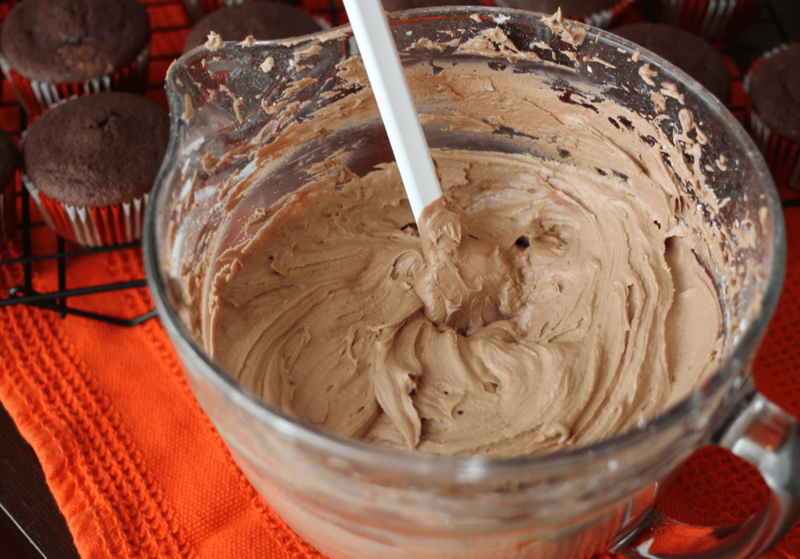 Fill each cupcake cup 3/4 of the way full with batter (I used a 1/4 cup batter for each cup). Bake for 16-19 minutes (I baked mine for 16), just until an inserted toothpick comes out clean. 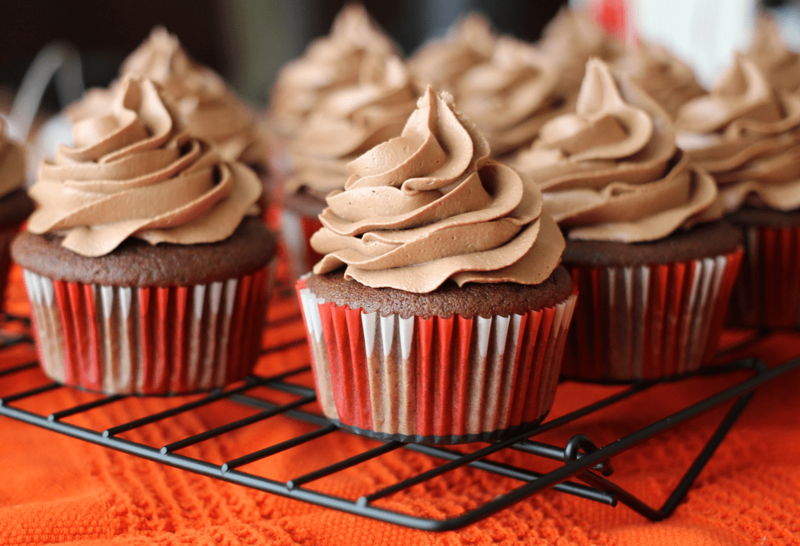 Cool the cupcakes completely before frosting with the oh-so-delicious Nutella frosting. In a large bowl, beat the softened butter on medium speed with an electric or stand mixer for 2-3 minutes, until smooth and creamy. Add the powdered sugar and continue to beat on medium speed until well blended. Add the Nutella and continue to beat on medium speed. Add 3 tablespoons of heavy whipping cream and the vanilla extract. 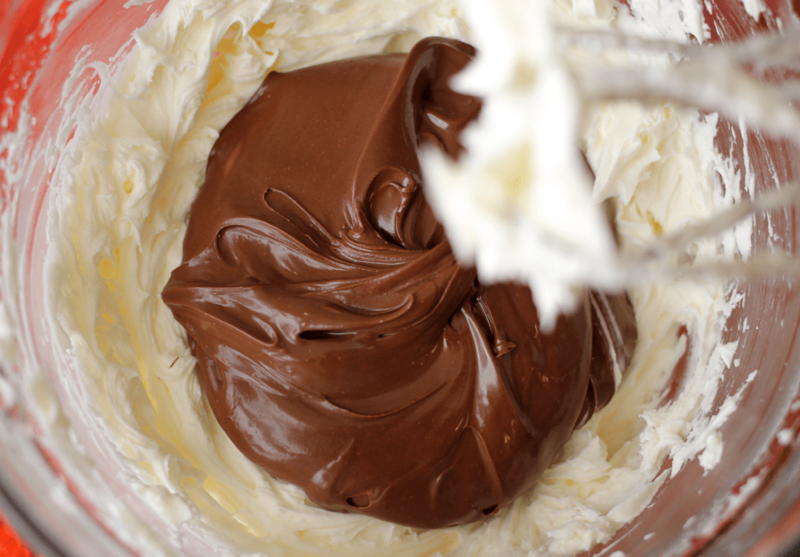 If the frosting is too thick, add more heavy whipping cream (1 tablespoon at a time). If the frosting is too thin, add more powdered sugar (1/4 cup measurements at a time). Add in the 1/4 tsp salt and mix until everything is well blended. 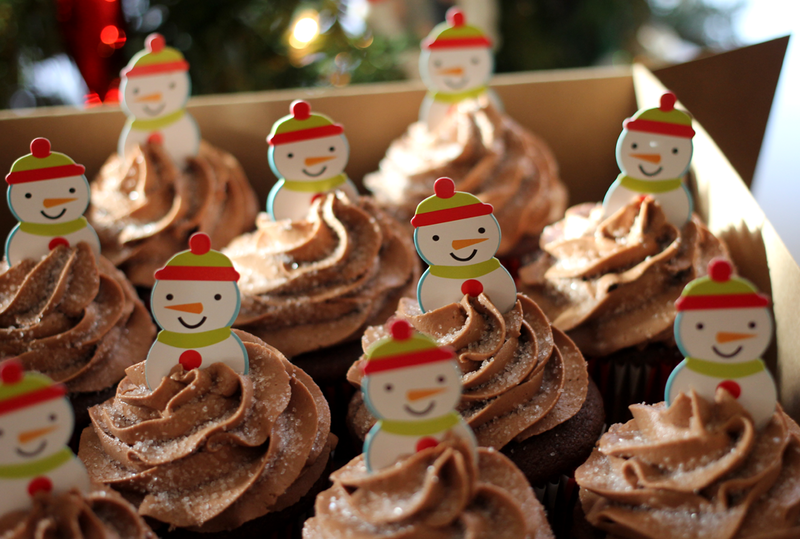 Pipe the frosting onto the cooled cupcakes and eat the rest. You deserve it.